One of the earliest images in this project looked at a Bonwit, Teller, & Co image and this one is in a similar vein in terms of its content. Again, the imagery surrounding the ad is striking in terms of the representation of elite white women being wooed by elite white men with cupid smack-dab in the middle, while the entire scene is held up by either Africans, Middle-Eastern or Southeast Asian workers. 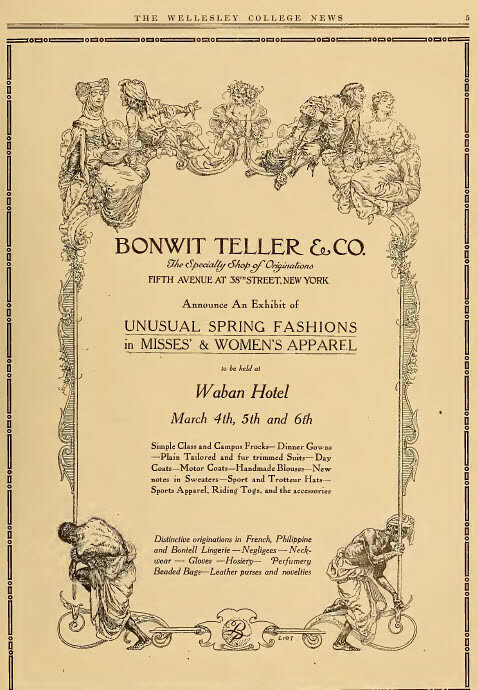 It's such a strong message about how the Bonwit Teller & Co as well as the society at large view race. I know this was fairly common for the time, but it is striking to how clear of a message such an image communicates about the nature of race in American society.